Are Cats a Problem in Your Yard? Protect Your Birds! Any outdoor cat can be a threat to birds - but you can help. It is estimated that domestic cats, whether they are loose pets, feral cats or strays, kill millions of wild birds each year in the United States alone. Fortunately, savvy backyard birders and pet owners can take easy steps to protect their birds without giving up their pets or enjoying feathered visitors to the yard. By using several methods to control both the cats’ behavior and the birds’ habitat, the risk to backyard birds can be minimized. It is virtually impossible to train cats, even the gentlest pets, to avoid the hunting instinct that can injure or kill wild birds. While some training methods may be effective, it is often easier to control a cat’s behavior to minimize interaction with wild birds and to prevent an overpopulation of feral cats that will prey on birds. Keep pet cats indoors at all times. If they must go outdoors, do not leave them unsupervised, and do not allow them outside during early morning or other peak bird feeding times. Outdoor enclosures - often called cat patios or "catios" - are another option that can allow cats outdoors without endangering birds. Keep cats’ claws trimmed to make it more difficult to climb trees or catch wild birds. It is not necessary or recommended to fully declaw cats, but filing or trimming their claws can reduce the effectiveness of their most dangerous offensive weapons, particularly on the front paws. Use collar bells to warn birds of a cat’s approach. While this is not always effective, it is one step that can be useful when birds are alerted by a ringing or tinkling bell. Similarly, putting brightly colored or patterned collars on cats can help catch birds' attention so they notice the predator. Do not feed feral cats. The instinct to hunt is independent of hunger, and well-fed, healthier cats simply have more energy to attack birds and other wildlife. Instead, report feral cats to a local animal shelter for capture and population control. Spay or neuter pet cats to prevent adding to the pet population and potentially adding to feral cat colonies. If a cat does have unwanted kittens, be sure they are all adopted by responsible families that will spay or neuter their new furry family members and keep them safely indoors. Consider using humane traps to capture stray or feral cats to transport them to a local animal shelter. Animals at the shelter will also be spayed or neutered, which will help control the pet population. If possible, contribute financially to local animal shelters or volunteer at their facilities to ensure they can continue to help control stray pet populations. Even backyards that are not home to domestic cats may be visited by stray or lost pets, neighbors' cats and feral animals that can kill the birds. Taking proper steps to create a safe bird habitat will minimize the dangers of any backyard cats. Keep bird feeders and bird baths at least five feet from shrubbery and cover that can conceal a stalking predator. Ideally, feeders should be 10-12 feet from potentially dangerous cover so birds can easily react if a cat attacks. Opt for landscaping that will discourage cats even while it nurtures birds, such as thorny bushes that will keep cats away but yield berries for birds to feast. 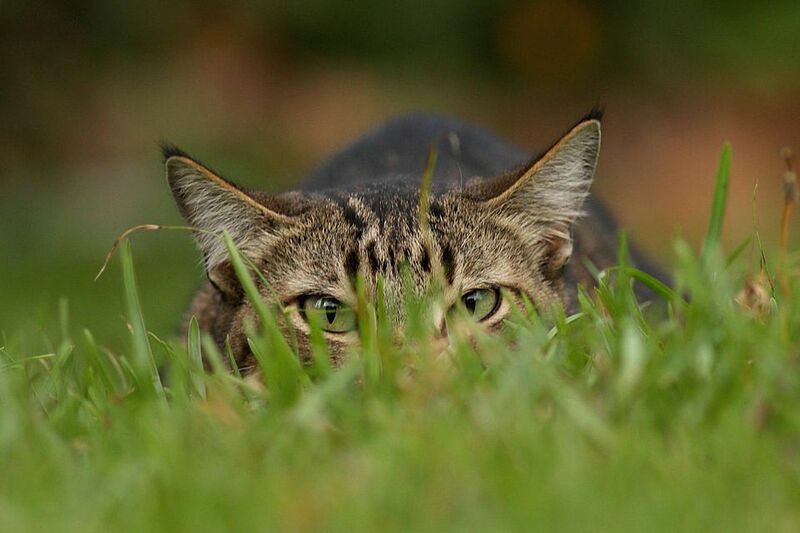 Sharp mulches can also keep cats from prowling nearby. If possible, install a decorative or wire fence in front of shrubbery or hedges that may conceal predators to prevent them from attacking birds from these vantage points. Even a short fence can thwart a predator's attack. Investigate yard fences regularly and repair or block gaps that may be access points for wild or feral cats. Similarly, be sure there are no access points beneath decks, behind sheds or in other areas where predators can hide. Choose safe bird house designs with steep roofs and lacking perches to help deter predators. Keep nesting boxes at least eight feet off the ground to minimize the possibility of a cat jumping to the box. Check brush piles and shrubbery regularly during the nesting season for ground nests and fledgling birds that are most vulnerable to prowling cats. Avoid using low feeders or ground feeders that make it easier for cats to capture wild birds. Clean up spilled seed regularly to minimize ground feeding birds. Use plastic or metal poles to support feeders so cats’ claws cannot help them climb to the feeder. Baffles are another option to deter hunting cats. While it can be frustrating to take multiple steps to keep backyard birds safe but still find evidence that predators have been hunting, it is never acceptable to take steps to deliberately harm any animals. Local laws and community guidelines will often prohibit any shooting or other harmful techniques against cats. Furthermore, it is irresponsible to use lethal traps, poisons or other tactics that could hurt other animals, including birds. Also remember that other predators will hunt birds, including raccoons, snakes and larger, avivorous birds, and the evidence they leave behind can look similar to a cat attack. By using a variety of different techniques to keep backyard birds safe from cats, it is possible to minimize the feline risks in your yard and keep every bird that visits as safe as possible.